These meatballs bake up in less than 15 minutes and are perfect for serving at the next football game! Preheat oven to 500 degrees. Spray a large baking sheet with non-stick spray. Add the ground chicken, almond flour, Parmesan, garlic, egg, chives, and onion powder to a mixing bowl and mix with your hands until combined. Shape mixture into 12 evenly sized meatballs and place on the prepared baking sheet. Bake for 13 minutes or until chicken is cooked through. Whisk together the hot sauce and melted butter in a bowl and add the meatballs. Toss gently to coat. 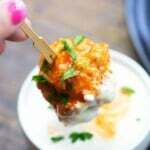 Serve meatballs hot or cold with a drizzle of ranch dressing. For extra spicy meatballs, add ground cayenne pepper to the meatball mixture.